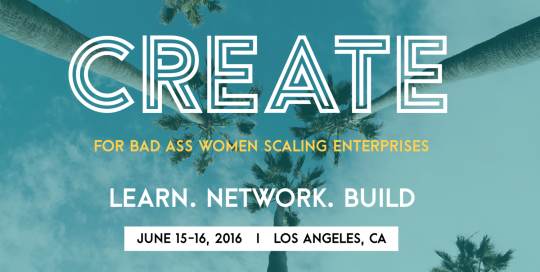 Yesterday I spoke at the Create Leaders BAWSE conference in LA. The speaker line up included Russell Simmons, Jillian Manus, myself, etc. Honestly, I set everything up 1 hour before my presentation, and it completely paid off. Part 1- Where do you get these crazy ideas? Before I share the details of the crazy experiment I ran, I want to tell you WHERE the experiment idea came from. Because it actually came from merging 2 separate tactics together. Tactic #1 came from my friend Danielle Leslie. 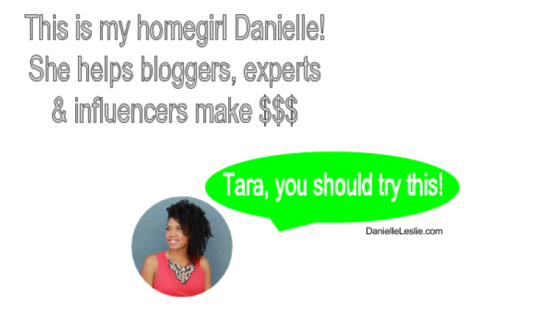 Danielle is a crazy genius when it comes to course selling & list-building. And a few weeks ago, Danielle recommended that at the end of my presentation, I should offer 1:1 office hours to the first 10 people who came up & talked to me. She recommended I get out a pen & paper & have people sign up for office hours on the spot. The strategy was to generate urgency by creating a big line waiting to signup! As a digital girl, it seemed inefficient to have people write their name on pen & paper for office hours. But I understood the psychology of creating in-person urgency around free office hours with me…. …So I was willing to try the idea. Old School Pen, Paper, & Urgency (details on how that performed below). But a few days after talking to Danielle, I was listening to the Conversion Cast podcast & heard something that also really inspired me! 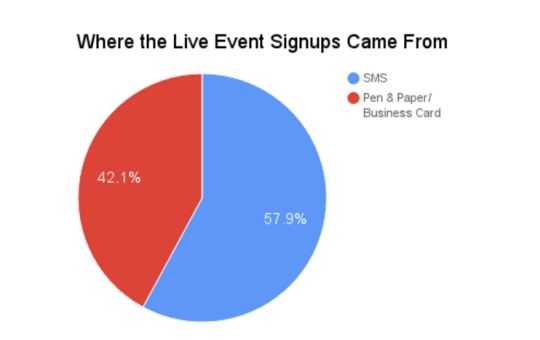 The podcast episode discussed a case study on how marketer, Bob Jenkins, uses SMS text messaging to convert audiences at live events. Bob asks his audience (on the spot) to text a ‘word’ to a ‘number’ in order to get a special gift. And I thought- Oooh I should try that! 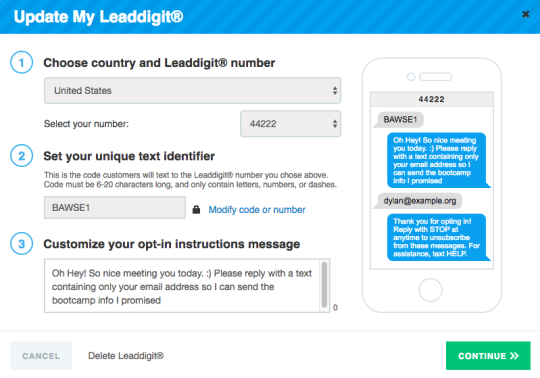 The New School way- SMS lead generation. Now remember I told you that I set this all up 1 hour before my presentation? Step #1- I stumbled around! I started off looking for the cheapest solution. I searched ProductHunt, but I was super surprised to not find many options there. Then I found JoinbyText.com & TextMarks.com, which were $19 & $49 respectively, but user onboarding was taking a long time & I was in a RUSH. I landed on LeadDigits, which was more expensive than the other options, but given my time crunch, the price was totally worth it. It took me 5 mins to set everything up. 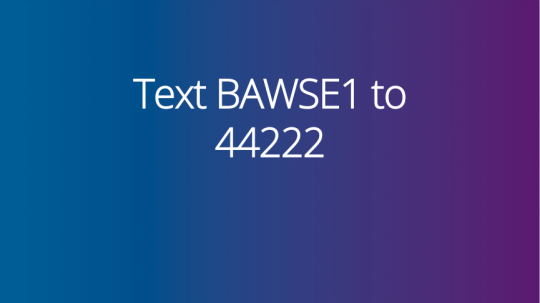 I created my own unique code (BAWSE1, inspired by the name of the event). So I stood there on stage & delivered a killer presentation! 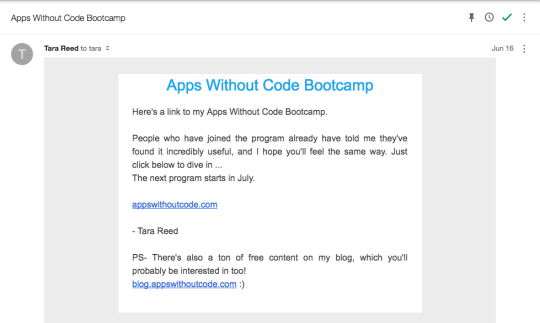 And at the end, I offered to share my slides & details on my Apps Without Code Bootcamp with the audience. I encouraged everyone to get out their phones & text me if they were interested. And then I paused to give the audience time. The novelty of the text code made everyone smile & a lot of people pulled out their phones. Next, I explained that people often find it helpful to talk 1:1 with me about their app ideas & the best way to start building them. So I offered a handful of 1:1 calls with the first people who signed up on my list in the back of the room. 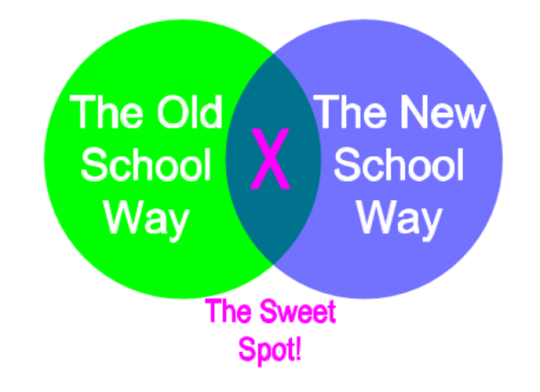 I combined the old school way, which created urgency with the newer school, which felt really novel to the audience. As a result 57% of the audience opted in. But that success was totally reliant on the fact that I COMBINED the two strategies. While most people engaged with me via SMS, there were A LOT of people who rushed to talk to me immediately afterwards. 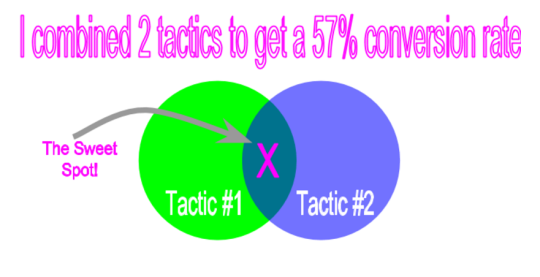 If I had done ONLY the SMS strategy, I would have lost over 40% of my conversions. So I’m super glad I tried both! Offer a Juicy Digital Gift: Since I planned everything last minute, I didn’t have time to make a juicier lead-magnet (like a checklist or getting started guide). I bet a sweeter gift would have converted better than an offer for the presentation slides & more info on my Bootcamp. Pitch the Text Code Twice: I only pitched my text code once (at the end of the presentation). Next time, I’ll try it TWICE: once at the beginning of the presentation and AGAIN at the end. The In-Person Line Effect Is Still Valid You can be high-tech if you want, but FOMO (fear of missing out) still sells & works best in-person. Stay tuned for an update on this post. I’ll let you know how I’m converting these leads into paying customers. Next Next post: Want to Build Your Own App? Great post Tara. Glad to see you’re doing well!